This time we really bring you something special: if you have been saving up for the vacation of a lifetime, you should go on one of the luxury Asia cruises we have just found from $4,688 per person including airfare and taxes. Book now and sail for 15 nights aboard Oceania Cruises’ beautiful Nautica on various dates through January 8 2016. The amazing luxury cruise deal was provided by Oceania Cruises. However, a wise traveler knows that the more providers one checks the better the chances to finding the best offer. With the below screenshot it will be easier to find this deal. Note that Nautica will embark from Singapore and will stop for excursions and sightseeing at the ports of Koh Samui – Thailand, Bangkok – Thailand, Sihanoukville – Cambodia, Ho Chi Minh City – Vietnam, Hanoi – Vietnam and Hong Kong – China. You will also spend four full days at sea cruising the Gulf of Thailand, South China Sea and Hainan Strait. Note that you will have to fly home from Hong Kong as the ship does not return to Singapore. Take a look at the cabin types available on the ship and see the lowest price for each of them. 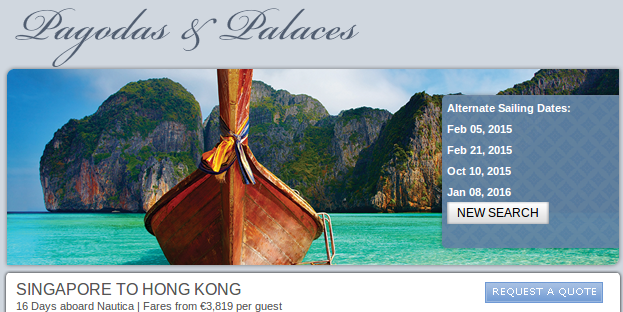 This entry was posted on Friday, December 19th, 2014 at 4:58 am and is filed under Cruise Deals. You can follow any responses to this entry through the RSS 2.0 feed. You can leave a response, or trackback from your own site.